PapaDragon wrote: This will not be used against fleets, this is third strike weapon. A city killer (subcontinent killer actually). This thing can travel for weeks or months. It is like the Burevestnik. You think the war is over and than... BUMM! Navigation and communication could be possible with ELF. Quit slow, but good enough for the exchange of some data. Or it could use a buoy, that swims a few metre unter the surface. Some tests with the Harpsichord underwater drone werde done with the Seliger. The Poseidon is a little bit to big for a container. Hole wrote: This thing can travel for weeks or months. It is like the Burevestnik. You think the war is over and than... BUMM! Of course it was shown targeting CSG, depicting it's real purpose (taking out cities) would not look good from PR standpoint. Why would you need 100MT salted warhead for carrier group when 2MT standard one would do just fine? It's just like every single nuclear weapon ever: on paper they only target military facilities but everyone knows what real targets are. So it could be armed with some self defence torpedoes, but its primary armament will be these port killer torpedoes... I would expect it could also be equipped with cruise missile launchers and use those nuke powered unlimited range missiles... it would be the ideal platform. PapaDragon wrote: Of course it was shown targeting CSG, depicting it's real purpose (taking out cities) would not look good from PR standpoint. Ture about PR but who told us that 100Mt is the only option? CSG is viable target. Cost is billions of USD and thousands of people with strategic value. Costs are almosgt 2 orders of magnitude less... I still dont buy only 100MT option + coastal stuff. They already have naval nukes for taking out CSGs, they had them since 60s and in all sizes and launch systems. They don't need massive nuclear torpedo for that when they already have supersonic missiles and loads of standard and supercavitating torpedoes with nukes all tested and in service. Literally only purpose for this drone is to kill cities, have you seen size of that thing? It's twice the length of Bulava. Specialized sub just for this? That's 100MT + Cobalt. Nothing else would make sense. PapaDragon wrote: They already have naval nukes for taking out CSGs, they had them since 60s and in all sizes and launch systems. not from 1-2 thousands km high seas though. Skhval with range 15km vs 2000km is not really comparable. With Poseidon surprise is best . Poor detectable at distance and hard to kill when is under. Let's agree to disagree. To me CSGs are viable targets and 100mt is not only option. Did I say anything about limited war? This is precisely why you need to get them in Island and west, PErsian Gulf and down. South Atlantic. There still strong bases there with nuclear assets. Do you seriously think that they are stupid enough to start a nuclear war over one of thier carrier groups being sunk for misbehaving? Its always better to lose one carrier group than you entire country. There was an article on Sputnik that talked about the possibility to turn the Poseidon into a weapons carrier, fit it with torpedos or even cruise missiles, that could be deployed like mines. According to this Sutton guy the Sarov was the test boat for the Poseidon. 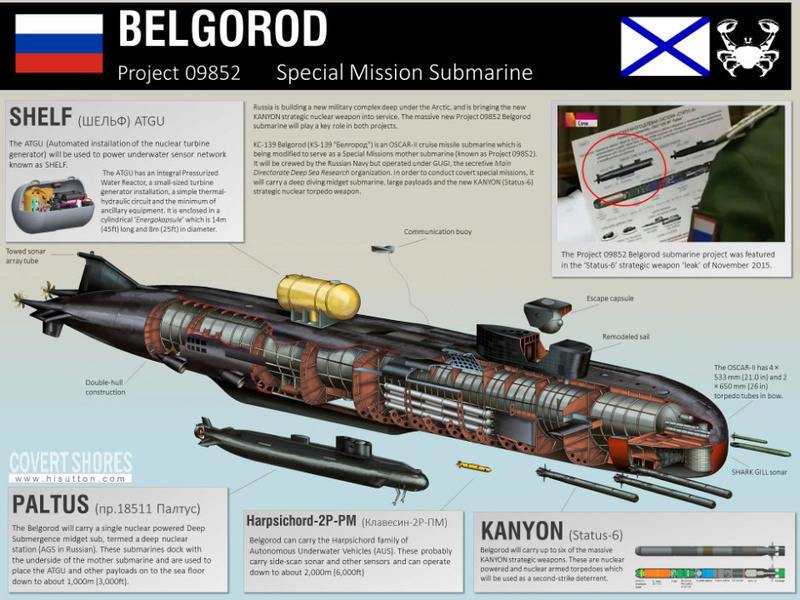 Now they are refitting the Belgorod and building the Khabarovsk. There is also the possibility that Podmoskovye (Delta IV) could be used to carry one. Poseidon's biggest deterrente value is as city killer. This is the highest price that a country can pay. "One million dead koreans would be worth it...!" They are insane. They would only believe in it, after the mushroom cloud had risen over Washington or New York. Khabarovsk is the platform for this weapon. Since they will need more than one you could say it is about to become lead ship of ''Khabarovsk-class''. Belgorod and Podmoskovye already have their duty roster full, they will not be carrying Poseidon. The-thing-next-door wrote: Do you seriously think that they are stupid enough to start a nuclear war over one of thier carrier groups being sunk for misbehaving? 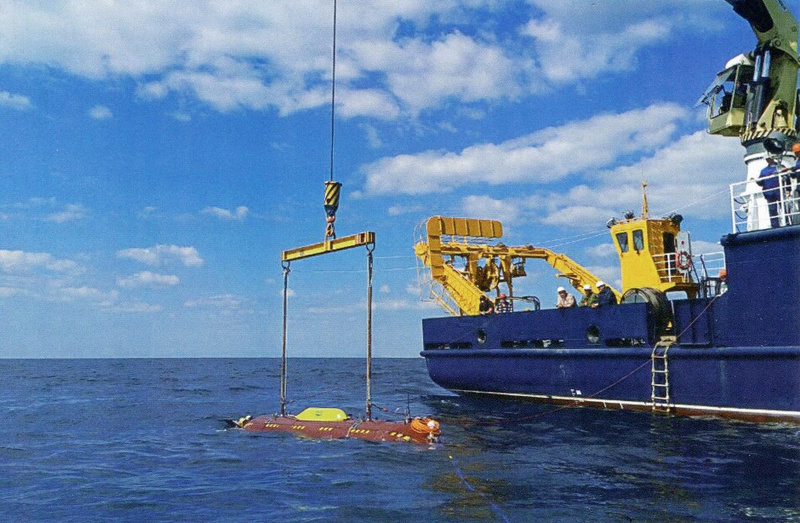 d = 925 km, - 2,0 ... 4,6 m.
Podmoskovye is supposed to be able to carry one under her belly instead of a mini-Sub. Operation Crossroads, explosion test bomb Baker on Bikini > 4000 times smaller (23kt). It was on 27 meters deep though. Not all ships were sunken but were so high radioactive they needed AFAIK more then one year to do something about it.